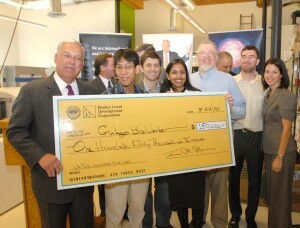 Mayor Menino visited Ginkgo today to formally announce our move to Boston and present us with a $150,000 check from the Lifetech Boston loan program for early stage startups. Barry gave him a tour around our new digs and even showed him a demo of one of our Ginkgo-bots. You can check out coverage by the Boston Herald and the Mass High Tech. We’d like to give a shout-out to all those who made our move to Boston possible – in particular Martina Toponarski from Lifetech Boston, Bill Nickerson from the BLDC, Mayor Menino, and Ginkgo’s landlord Paul Mustone from Reflex Lighting. Update: See also Emily Singer’s Technology Review article and Mayor Menino’s Wicked Local column.